The design philosophy behind the new Maruti Suzuki Baleno hatchback is called Liquid Flow which sounds similar to arch-rival Hyundai's Fluidic design language. The latter has worked well for the Korean manufacturer and Maruti Suzuki wants to follow suit. The styling is quite sober though and the highlight is the sweeping shoulder line. The new design gives it styling distinct from the rest of the Maruti Suzuki lineup. There's the blackened A-, B- and C-pillars that give it a floating roof, a sporty roof spoiler and an all-new grille that is away from the typical grille designs we have seen from MSIL so far. The Maruti Baleno also gets LED DRLs and projector beam headlights on the range topping models. The car sits on 12-spoke alloys shod with 195-section tyres on the top spec trim. The lower trims get 185-section rubber. The Maruti Baleno hatchback measures 3,995mm in length, which is the same as the Hyundai Elite i20, but the boxier shape of the Baleno makes it look much larger than its Korean rival. The exterior shape also gives it a roomy cabin. The cabin design is all new too. 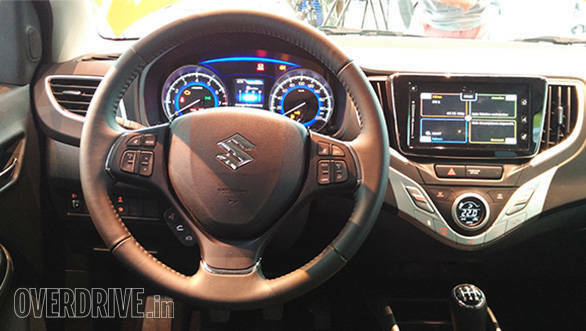 It comes with a 4.2-inch multi information colour display in the instrumentation and a 7-inch touchscreen infotainment system with the Suzuki SmartPlay interface that also gets a reversing camera and an integrated satellite navigation system. It also supports the Apple CarPlay smartphone interface, which is first in class along with the Siri integration. The knobs, AC controls and switches are all-new too. The cabin also gets a tinted glasshouse that cuts out the UV rays. All black interiors like in the Maruti Swift lend a classy tone to the cabin. Two engine options - a 1.2-litre petrol and a 1.3-litre diesel are available on the Maruti Baleno hatchback. The K-series petrol engine puts out 85PS and 115Nm. The diesel is the 75PS/190Nm variant. It's a downer that the 90PS version of the 1.3-litre mill wasn't considered for the production model. The petrol engine gets two gearbox options - a 5-speed manual and a CVT automatic. The diesel only gets a 5-speed manual. The chassis, Maruti claims, provides better safety through optimally designed crumple zones and boasts a lighter construction than the Swift platform. The petrol trims weigh 865-910kg and the diesel trims tip the scales at around 960-985kg. Maruti has given the Baleno hatchback a 37-litre fuel tank with the claimed mileage on the Baleno diesel being 27.39 kmpl while the petrol stands at 21.4 kmpl. The Maruti Baleno gets disc brakes in the front and drums at the rear. The car gets McPherson struts at the front and a torsion beam rear axle. The turning radius is 4.9m. What is laudable is that ABS and dual airbags are standard across the range. 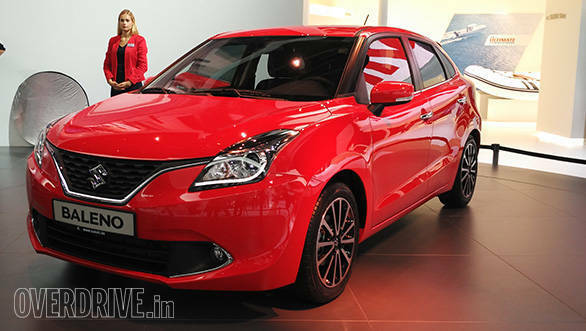 The Maruti Suzuki Baleno will be available in four trim levels - Sigma (base), Delta, Zeta and Alpha (top). Six colour options will be available at launch, which is scheduled for October 26, 2015. Stay tuned for the review from OVERDRIVE.